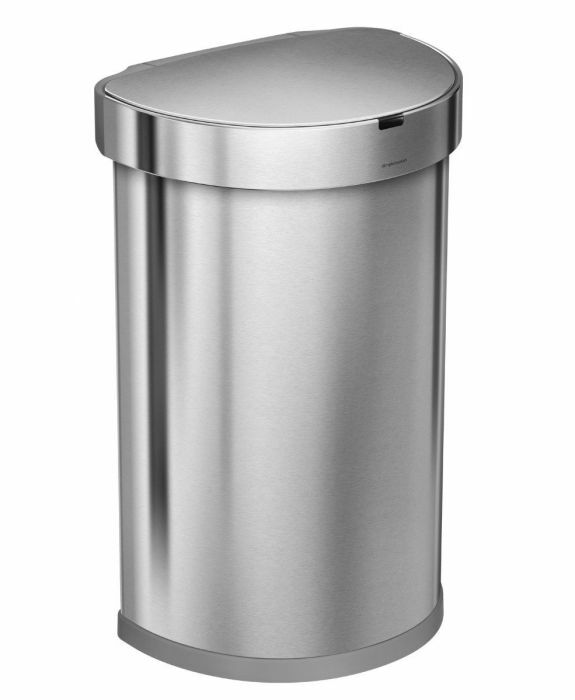 This semi-round bin sensor bin is beautifully designed with sleek styling and all steel finish. The rounded shape of the Simplehuman ST2009 gives it a touch of elegance and avoids sharp corners. It comes with Simplehuman's new dynamic smart sensor technology which adapts to your tasks and comes complete with a soft close lid. The innovative liner pocket means that replacement liners are always to hand and maximises the space available. When the lid is closed, the sensor range is short and focused resulting in no false triggers. When it’s open, the sensor expands to cover the area in front of the bin, so the lid won't close until you're finished. The elegant curved shape of this semi-round bin tucks away discreetly against the wall or island unit of your kitchen, giving you copious capacity without getting in your way. Liners are stored in a pocket at the back, so you can simply pull one through when needed: the liner rim lifts up for liner changing, and holds and hides the liner when closed. Only the slim profile horizontal part of the lid lifts in use, giving you lighter, smoother and whisper-quiet operation, and extra wide access. 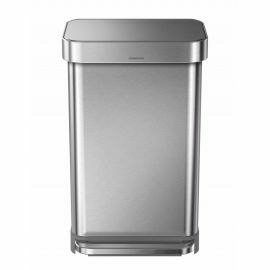 Yet another advanced feature on this Simplehuman kitchen bin is the invisible fingerprint-proof coating infused with silver nanoparticles to inhibit bacterial microbes, which make it cleaner and more hygienic. 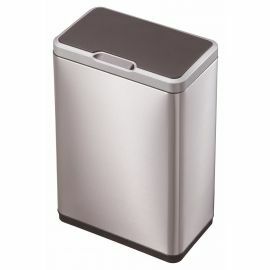 Simplehuman Code J liners (CW0259) are designed to fit this bin perfectly. Extra-thick plastic and double-seam construction means there’s no need for an inner bucket, making the most of full capacity within the space-saving shape. The new Sensor bin is energy efficient and lasts up to 1 year with 4 AA batteries (not included). Body and lid in fingerprint-proof Nano-coated anti-microbal brushed stainless steel. Non-skid grey plastic base: kind to floors.